…and some cut off wheels, to boot. 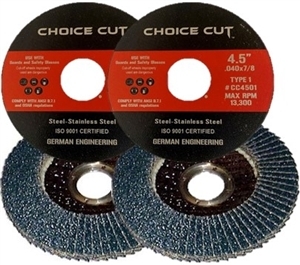 It’s our Flap Disc and Cut Off Wheel Combo Deal featuring Premier Grind 4.5" zirconia flap discs (German Made) and SELECT CUT 4.5” cut off wheels. Same drill as usual…Use the COMMENTSsection to let us know types and grits for the flap discs. If you leave this blank, we'll send T29 /10 - 40 Grit, 10 - 60 Grit and 5 - 80 Grit. Re: ***Flap Discs, Flap Discs, Flap Discs!!! There's madness in the air...although we're not sure how much longer our Combo madness is going to last. March Madness is in full swing and so is this Combo Deal. helluva deal, thx. just ordered. Thanks for your order...should be delivered on Monday. March Madness is winding down...two teams and two days. The Combo Deal ends tomorrow, April 8 at midnight.